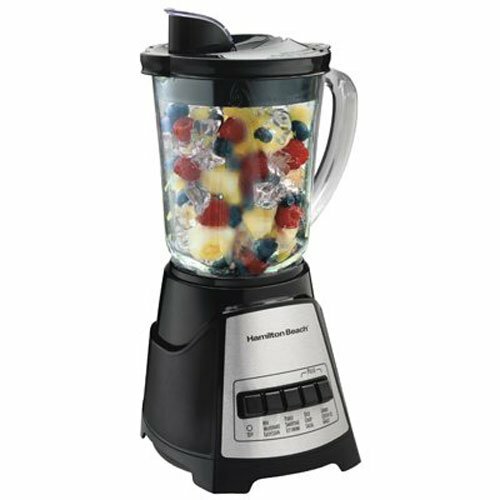 The Hamilton Beach 58148 seems to be a very popular countertop blender and its probably the price that makes it so. After my review of this blender I concluded that this is a good starting point for anyone who wants an option that doesn’t cost a fortune. Like I have always said, before buying a product you need to be clear on what you want to get out of the product. There is a range of products and a range of prices. The words “you pay what you pay for” are in most cases true, but it also depends on what you want. This is a good countertop blender if you are wanting something to prepare simple smoothies, milkshakes or protein shakes. If you are looking at preparing green smoothies, soups, dips, salsas or grinding then I would try to invest in something more expensive. This blender is very affordable for the most basic tasks and it is also easy to use. Click here to see the review of the chopper and how to purchase it. The unit comes with four buttons, two of which are pulse buttons and two speeds high and low. The pulse buttons are for dicing, chopping, salsa, grinding, crushing ice and grating. 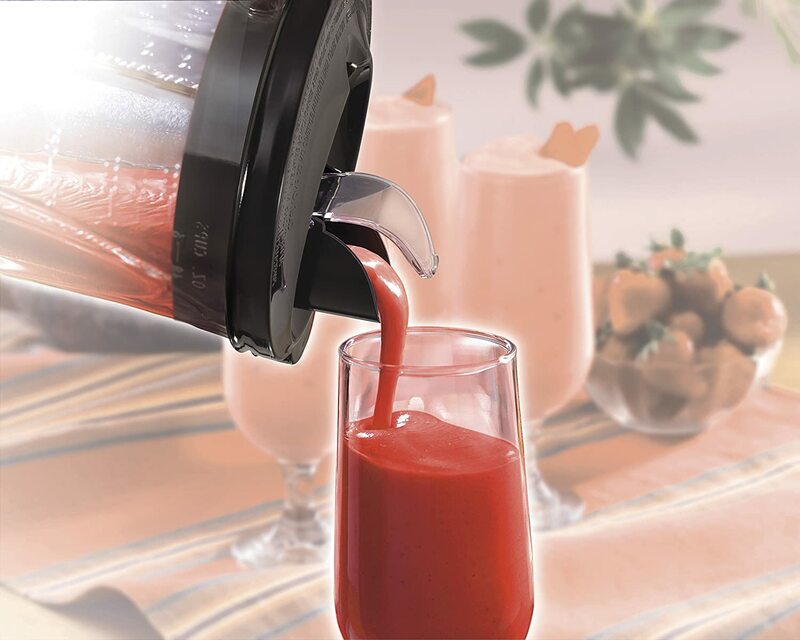 This blender is great for preparing smoothies, milkshakes and icy drinks. There are mixed feelings with regards to the performance of other functions. It seems like it does not properly chop or blend more fibrous ingredients. I read some reviews of people who successfully prepared dips, like hummus, creamy soups, smoothies with kale, celery and ice. Others have had problems doing this, and they have reported that the blender leaves chunk of food without processing. Either way, you’ll have to cut your vegetables and fruits into very small pieces and it may take some extra blending time to get things as smooth as you’d like. I need to clarify that this blender will not cook soup like the most powerful blenders, for example the Vitamix or Blendtec. Do not expect to add cold and raw ingredients to the blender, and get hot and cooked soup. But you can cook soup on the stove and then blend the soup in here. Otherwise, you could blend the vegetables first and then pour the mixture in a pot and cook it on the stove. The jar is made out of thick glass so it can handle hot liquids, but I do not think the glass is tempered. The manufacturer clearly states that this blender is not for mashing potatoes, mixing stiff dough, whipping egg whites, grinding raw meat, or extracting juices from fruits and vegetables. They also advise against storing food or liquids in the blender jar. This blender does not process dry ingredients. The manufacturer has advised that you need to have at least one cup of liquid (8 oz/250ml) to process any ingredients. You may need to add more liquid as you go along. Having said that, I read some reviews of people that have used this blender to grind seeds and rice. Carrots can be blended but it might take a bit longer. Some people had difficulties blending kale. I suppose you need to let it run for a bit before you decide it does not blend it. The blender takes its time till all the ingredients blend together. Remember you need water. Some people have asked me if you could do soybean milk or almond milk with this blender. I am sure you can do it. You can soak the almonds or soybeans before and then easily blend them. I used a less powerful blender to make almond milk. As said I soaked the almonds before and the blender had no trouble blending them. I read that someone has used this blender to prepare hazelnut butter. I am not sure how well that will work, since you do not use liquid for that. I tried to do sunflower butter with a similar type of blender and I was not successful. It did grind the seeds but it never converted it to butter. Maybe I was too impatient. Some people claim you could do onion paste or vegetable paste. To do so, you will need to chop the vegetables small enough .I am not sure I would try this with a blender. I would rather use a food processor, but if you do not have one, you can always try with this blender. The blender is not a chopper. It would blend the vegetables. If you need to chop them you can get the additional attachment. 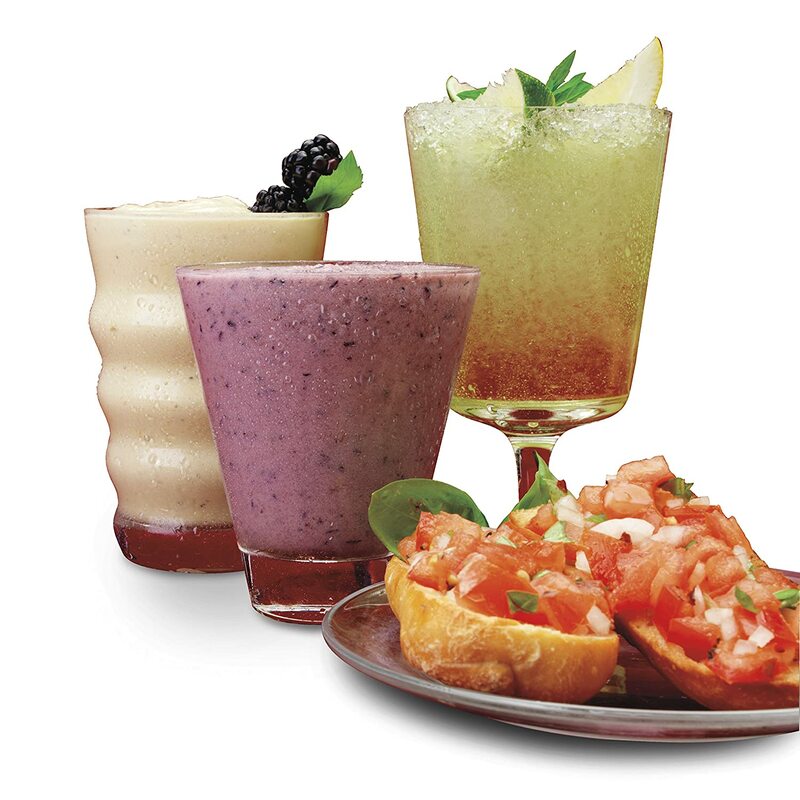 The Hamilton Beach 58148 Power Elite Multi-Function Blender comes with a wave action system. The wave action system is designed to pull the mixture down to the blades and as a consequence have a smooth end product. I have my doubts about the efficiency of this wave action system. I have found out that people had to stop the blending process to mix the contents with a spoon. The problem might be that this blender has a wide base around the blades. You would think this is a good thing, as it will allow you to clean around the blades with ease. My personal feeling is that the wide base and the wave action system do not work together very well. The blender may have problems also making puree out of puree, but not completely smooth. If that is the case for the price I would consider also a hand blender. My research of the reviews indicates that there are many customers that are satisfied with the results, but many are not. If you are planning to do simple milkshakes and fruit smoothies then I would consider this blender. For the price of it, you cannot really go wrong. If you want to do more complex things, like soup, salsas, grinding, chopping, crushing ice, and you want to obtain quick results then I would go for a more expensive blender. After essence. The Jar is the best part of this unit. It comes with a thick jar glass. I prefer glass jars rather than plastic. Glass does not keep odors, retains temperature and it is easy for cleaning. This 40 oz glass jar is heavy, and it comes with measurements written on it. The base of the jar is very wide. For all those people that cannot live without a dishwasher you will be happy to learn that the jar is dishwasher safe. The thick jar will handle hot substances without breaking. In fact, it has been thermal-tested to ensure it will not break due to temperature changes. The jar holds 48 ounces, equivalent to five cups. The lid fits tightly and it comes with a unique lid and spout that makes pouring liquid easy and mess free. It also has vent that will pop up open if hot liquids built up pressure or that can be left open if you are blending hot ingredients. The plastic of the lid is not the best quality plastic, so the safety flap might not always close properly. This no mess pouring spout is not a filter. All it does is help you to pour the liquid without any mess but it does not filter anything. There is also a small lid you can pull out to pour additional ingredients whilst the unit is in operation. The jar is also easy to attach to the base. When picking up the jar from the base, do not try to unscrew it form the base but rather lift it. If you try to unscrew it, you might end up unscrewing the blade gasket and have a mess in your kitchen. To clean the jar is it best if you take it apart and remove the blades, as those easily house bacteria. This will apply to any blenders. The rubber ring of this blender is sealed into the unit. Don’t you love when you cannot find the rubber ring? It happened to me once with my old blender. I ended up ordering an extra rubber ring, only to realize the ring was where it was supposed to be. There was some controversy regarding mason jars. Some people said they could fit a mason jar, but others said that they could not. So to be safe I would say you cannot fit a mason jar. If you have any older Hamilton Beach glass jug from the mid 1990’s, you will not be able to use it with this blender. . 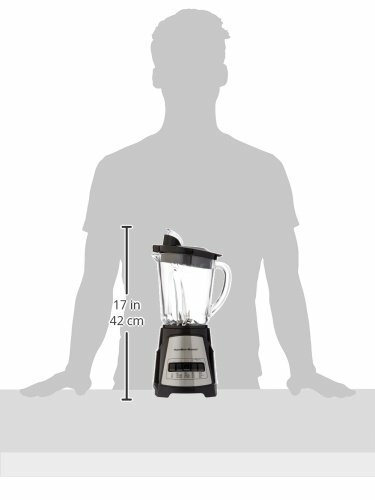 The blender is suited to be used with 120v-60 HZ. Do not attempt to use unit with other voltage. The blender base is quite sturdy The Hamilton Beach 58148 Power Elite Multi-Function Blender is equipped with a 700Watt power. It is a powerful motor for most smoothies. The base of the blender where the motor resides is made of plastic. The plastic is not high quality, but for the price of the unit you cannot expect more. It is important to reiterate that the blender needs liquid to operate properly. As long as you supply liquid the motor will be able to handle it. So if you are happy with thin then I would suggest you look at another blender. The base is light but sturdy and it does not jump or move when in operation. You can leave it running without worrying that it will move. The heavy part of this blender is the glass jar, which will not break easily. 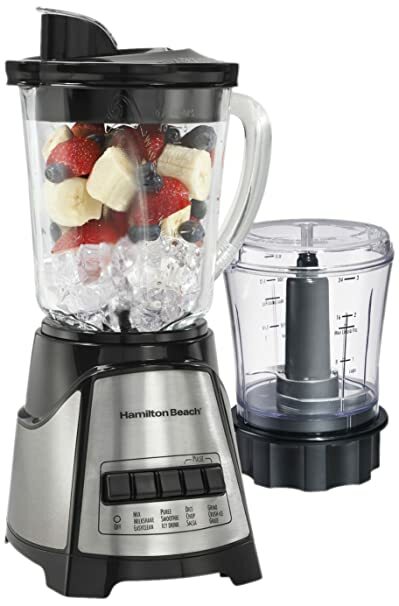 The Hamilton Beach 58148 blender controls are quite simple. The good point about the control is that the buttons face forward and you need to apply a bit of force to engage them. There is no risk of pressing the buttons accidentally. The blender comes with 4 buttons and an on/off button. Each button has 3 different functions depending on what you want to do. The buttons are strong and durable. Depending on how you press the button the blender will perform a different function. If you pulse the button it will perform a function at a certain speed. If you hold the button in and make it stay on the entire time, it will perform another function at a different speed. The speed will vary accordingly. Two of the buttons are pulse ones. That means that the blender will operate for as long as you press the pulse button down. This blender comes with four blades, two upper blades and two lower blades. These powerful blades are permanently attached to the gasket. The blades from the jar Do not put the jar with food or liquid in the freezer. This may damage the blades. Make sure you twist the blades securely at the bottom so it does not leak. The blender has an easy clean function. If you want to clean your blender between batches, all you need to do is fill it up with 2 cups of warm water, add a drop of dishwasher liquid, put the jar on the base and run the easy clean function for ten seconds. Rinse it and use it again. To be honest, I am not sure what is special about the easy clean function. I normally also add dishwashing liquid and water to my blender. Sometimes I add a bit of white vinegar. I then use the pulse button or any other function to have it cleaned. My blender does not have an easy clean function. Do this type of cleaning only between batches. After you have finished using dishwasher or wash by hand. The chopper bowl is a 3 cup bowl made out of plastic. If you do not want to use plastic, then it is not worth getting the attachment. I am not sure why they did one jar glass and the other one plastic. Normally people that do not like using plastic they try to avoid it at all costs. Besides, you normally would use the chopper to chop onions, and a glass bowl would have been ideal to prevent the onion smell in the jar. The chopper comes with two blades that are situated very low in the chopper. There is no other blade along the long shaft that you see in the image. You need to cup the fruit and vegetables in smaller pieces, because otherwise the blade will miss the food. From the reviews I read, there are mixed feelings about the chopper. Some people are happy and some say that the chopper does not chop. Perhaps they did not cut the vegetables or fruits first then why go to the trouble of getting the chopper out? If you do not mind the double then I would search for another chopper. You can get the blender alone here or the blender with the chopper here. Height: 14.69 inches (37.31 cm) Width: 6.5 inches (16.51 cm) Depth: 8.66 inches (21.99 cm) Weight: I could not find the exact weight, but the shipping weight is 8 pounds (3.62 kg). The cord is approximately 24 inches long. They keep it short for safety reasons. The plug is a two pronged plug. The storage is simple. 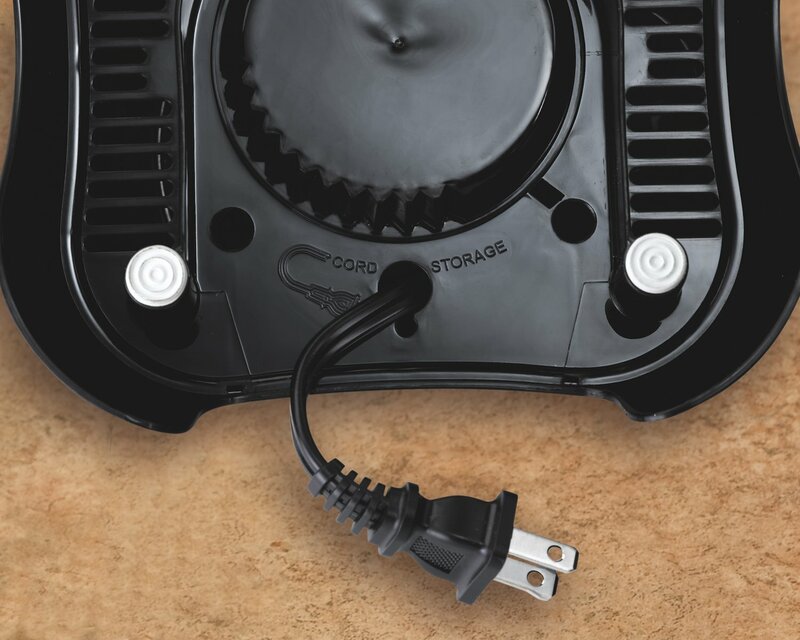 The cord can be stored under the base, It is not automatically retractable, you have to push it back manually. The unit is elegant, black and silver so it can stay in the counter. The unit is to be used with 120 volts – 60 Hz. If you are planning to travel overseas, you might not be able to use this blender. The manufacturer advises against using a portable voltage converter to use unit with 220 volts. If you do, you run the risk of damaging the unit. Please note that the warranty will be voided if you use the appliance with another voltage than the specified one by the manufacturer. The warranty period is of 3 years in the USA and 5 years in Canada. If you need the serial number, you can find it below the sticker, embossed in the plastic. Amazon gives you the option of buying this blender with frustration free packaging. This is an environmentally friendly option. Frustration free packaging is an easy to open packaging done by Amazon. The manufacturer will package the product so that it is easy to open without using any tool. All you need to do is open the box without any tools. The box is an Amazon box, fully recyclable. The only accessory I could find was a CD with drinks recipes. You can get it from the manufacturer website, but having so many recipes for free online, I do not think this is worth it. It has only four distinct parts, which makes it easy to disassemble and assemble it back. No safety mechanism. The engine will work as long as it is plugged in. The lid can be hard to get off. Mixed job with ice and frozen fruit. Sometimes it will blend it nicely and sometimes it will not do it. It has difficulties processing thicker mixes, like thick smoothies, dips or salsas. The result is thinner drinks or batters. No consistent results. Sometimes the functions will work well. Sometimes it will leave chunks of food or ice. Surprisingly, this product has a 4.1 star rating. 76% of the ratings were 4 and 5 stars. That tells you that people are happy with it. The point I want to stress is that you need to know what you want to get out of a blender. If you are happy with thinner drinks and batter, or if you just want it for shakes and simple smoothies and you do not want to spend lots of money then this blender will suit you well. You need to consider your needs and what you get for such a low price. 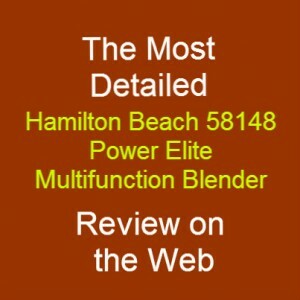 The best part about the Hamilton Beach 58148 Power Elite Multi-Function Blender is the price. You cannot really beat it. When deciding on how much to invest in this type of appliance, you need to consider what you want to get out of the unit. I think what you get for the price is actually a great product. But it might not always produce as you were expecting. I also want to reiterate that this is one of the best sellers blenders online. If I had to buy a blender for daily shakes and easy smoothies I would buy this one without thinking it twice. It is dirt cheap, so cheap that I could afford to chuck it away and buy a second one if I needed to. For the price you are getting a great product. The question is what do you want to use the blender for. If you are eating a plant based diet and would like to process thicker vegetables, make dips, salsas, soup or dough, then I would skip this blender. If I did not have the money for a more expensive blender, then I would go ahead and purchase it. After all it has good ratings and it is a best seller. On the other hand, if I could and I was not desperate for a blender, I would rather save and invest a little more in a different one that would do a better job. Another point you need to consider is how easily you get frustrated. Yes, this is a good looking unit and it is simple to assemble. But if you will spend more time than needed on the blender, because you need to stop every few minutes to mix the contents in order to get them near the blades, then you might end up getting frustrated and not use it any longer. In the end you need to weigh the money you will spend with the performance you will get out of it. For me, for a person that eats starch based and plant based meals, I would go for a more expensive blender.